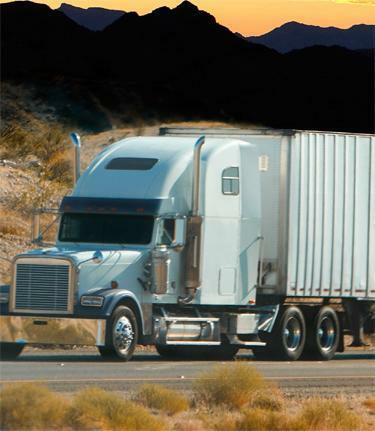 A leading manufacturer of tractor trailers and shipping containers found that nameplates made of Metalphoto photosensitive anodized aluminum have greater durability and legibility than etched stainless steel at a fraction of the price. Many truck trailer and container manufacturers, historically used etched and filled stainless steel for CSC Safety Approval Plates and VIN Data Plates. However, after years of abuse from road salt, impact abrasion, and sunlight exposure, the etched plates can be difficult to read. Illegible nameplates can lead to replacement costs, inability to track trailer location and maintenance, safety hazards, and in some cases, regulatory fines. Also, because etched plates are stamped with human-readable numbers, they can lead to human error and added labor cost. 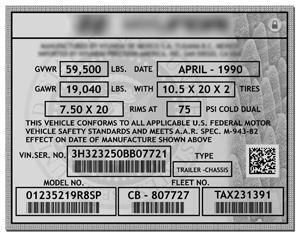 After a series of failures from damaged or illegible plates, a leading transportation equipment OEM needed a VIN Data Plate solution that would both last the life of the trailer and support machine readable bar codes. Durability: The Metalphoto image remains readable after prolonged exposure to salt water, synthetic road salts, sunlight/weather and impact abrasion. Legibility: Metalphoto graphics are cleaner and of higher resolution than etched stainless steel. That makes for great looking VIN plates but more importantly, it allows one to effectively incorporate the use of machnine readable bar codes for asset tracking. Affordability: Metalphoto parts typically cost 10-20% less than etched and filled stainless steel. Availability: Metalphoto is available from a network of qualified converters worldwide. Alternatively, Metalphoto can be produced on site for just-in-time printing requirements. Sustainability: Metalphoto is an environmentally sustainable process that has minimal environmental impact. Detailed Metalphoto performance specifications are available at www.metalphoto.com. Trailers, chassis and converter dollies, and shipping containers are subject to prolonged exposure to extreme elements. Degradation from road salt, ocean spray, abrasion, sunlight and weather threatens the readability of CSC Safety Approval Plates and VIN Data Plates. Metalphoto photosensitive anodized aluminum is a unique imaging technology that stands up to harsh operating conditions. The UV-stable, inorganic Metalphoto image is permanently sealed inside of anodized aluminum, offering unparalleled durability and image resolution. Since 1958, Metalphoto has been specified for applications where durability is critical. As a photographic medium, Metalphoto affords ultra-high image resolution and contrast - ideal for bar code labels. 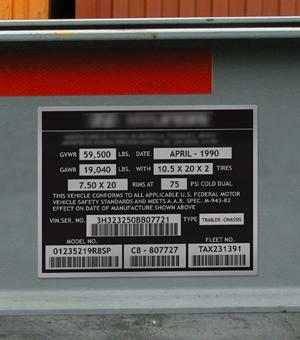 Machine readable bar code labels reduce human error and labor cost. Reducing errors and saving time is especially critical in the transportation industry where equipment must be where it needs to be, when it needs to be there and in working order. Etch and filled stainless steel is simply unable to hold consistently readable linear and data matrix bar code symbols. For this transportation OEM, Metalphoto's ability to hold durable bar code labels was a key advantage. In addition to the ability to incorporate long-lasting and durable bar codes, the high cost of stainless steel was of concern. Metalphoto nameplates can cost up to 30% less than etched and filled stainless steel due to material cost and processing labor costs. Material Costs: an equivalently sized Metalphoto nameplate (same gauge, same area) is typically 10-20% less than a similar product made of stainless steel due to the lower cost and weight of aluminum (aluminum = 2.70 g/cm3 vs. steel = 7.85 g/cm3). Labor Processing Costs: imaging and fabricating Metalphoto is a less labor intensive process than etched and filled stainless steel. Etching steel requires four steps (coat, expose, acid etch, ink fill) whereas Metalphoto only requires three quick steps (expose, develop, seal). Moreover, steel's hardness adds complexity to fabrication. The OEM needed to produce durable, serialized nameplates based on each container's specifications as the product is completed. With the help of Horizons Imaging Systems Group, they set up an on-site Metalphoto system capable of producing approximately 7,000 VIN plates per month (84,000 per year on average). On-site product requires a dedicated processing area, skilled operator, and metal fabrication equipment. Most customers interested in integrating the durability of Metalphoto into their product designs choose to purchase finished parts from Metalphoto's network of qualified converters. 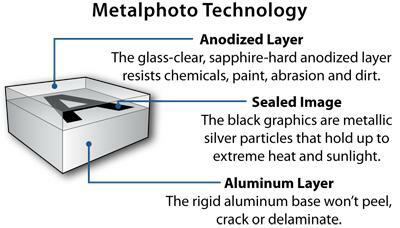 The Metalphoto Processing System is designed for reduced environmental impact. Processing solutions use low VOCs and all waste streams are neutralized or collected during the production process. Additionally, Metalphoto is designed for permanency - it will not need to be replaced. If replacement is desired, Metalphoto is easily recycled. Anti-counterfeit: because Metalphoto is a photographic technology, it affords covert and overt anti-counterfeit measures that make it a trusted deterrent for highly counterfeited products. SandShield™: for extreme durability in caustic or ultra-abrasive environments, Metalphoto's SandShield over-laminate adds extra protection.